Well, I know I said during my training for Ironman Arizona that I wouldn’t be doing another full in 2015. Well, I accidentally lied. Arizona went so AMAZINGLY well that I just couldn’t stay away until 2016. Also, the other race we had planned for, The Trans Rockies 6 day run just turned out to be too costly in money and time this year (we still want to do it and we have a few friends who want to do it with us). 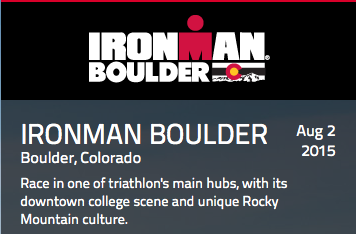 So once we ruled out the Trans Rockies that opened up the second half of the year…enter Ironman Boulder! I chose this race for a few reasons. First, the timing is perfect. The bulk of my training will be done in June and July when the kids are out of school. That helps me get my training in without as much to juggle. Second, Boulder has a special place in my heart. I have been visiting there since the early 80’s when my Grandparents moved there. I went to college there. And Stuart and I hope to move there once the kids are all off to college. Third, the course looks like it will be a good fit for my abilities. The swim is in a reservoir (that I used to row in), I know the run course fairly well, and the bike looks reasonable. The only real unknowns are the weather (could be hot) and how will I manage in the altitude. We will be able to drive to the race so that helps with the choice as well. Forth, I have the support of an amazing team with my Coeur Sports Ambassadorship! I am thrilled to be in the company of such great women and amazing sponsor and products! I just couldn’t stay away from Triathlon. And last, many of my Cactus Buddies from Arizona will be there!!! I am thrilled that I will be able to work with my coach again! Jen did an amazing job coaching me to a performance I never expected to have in me! I can’t imagine doing this without her on my team again! I am careful to not expect it to go quite as well as Arizona did. Mostly because it was so perfect in Arizona I don’t know how I could get that lucky twice! I plan to stick to the same training principles I used while training for Arizona. Biggest thing will be to keep things simple again. I will find a bike loop this time to mimic the Boulder course as best as possible and I may look into one of the altitude training masks. I would like to do one recon trip to Boulder to scout the bike course. Only issue is time and money (isn’t that always the case?). But one of the things that worked so well for me in Arizona was I knew the course. I need to feel that comfortable with Boulder as well. Of course none of this would have been possible without the love and support of Stuart. I really changed my mind about our plans this year (Grand Canyon is out as well). That really through his year up in the air as well. 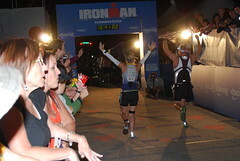 I am beyond grateful for his love and support to do another Ironman this year. I can’t wait to see what big race he picks so I can cheer him on as well. that’s awesome! It’s well thought out, it’s going to be great! YAY!! I can’t wait!! We are definitely going to have to meet up and get a Coeur photo 🙂 We will be out in Colorado (mostly in Estes Park) for 3 weeks leading up to the race, so let me know when you decide to come out and we’ll plan a meet. We are going to have quite a few Coeur ambassadors at this race…it should be a GREAT race!! So excited for you! My race partner and I were also considering trying Boulder this year. Either that or IM Canada. We know the Whistler course and would love to have a weekend there beforehand as you also mentioned, but man, the costs are crazy for a few days. Any advice on either course? Awesome! I hope I have THAT great of a day this go round in Maryland that I simply can not wait to sign up again! 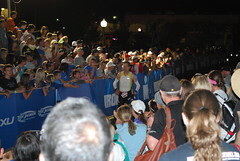 I’m also signed up for IM Boulder – for many of the same reasons (that it’s a special place…) and am excited about it! You had an awesome race at AZ – it would be hard to take a year away after that. Good luck with your training, and maybe we can meet in Boulder? I would love to meet up there! Friendly faces on the course are the best!